Wishing to be a wench? You'll look splendind in our starter wench set which includes your choice of our Wench Bodice, a Classic or Ruffled Chemise in your choice of color, and a Drawstring Skirt also in your choice of color. 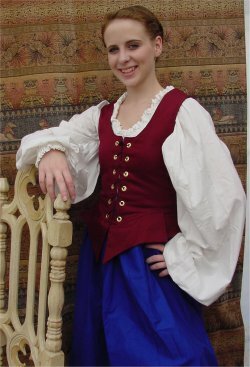 Our Wench Bodice, made of sturdy cotton twill, holds in the waist and two wide lengths of steel boning alongside the grommets add strength and help to lift up the bust. No corset is needed! The bodice is available in your choice of hunter green, burgundy, or navy. Machine wash cool, tumble dry on low heat. Order the bodice by your natural waist size. Our Chemise is made of 100% cotton muslin and is machine washable. This chemise with a drawstring neckline has very full and long sleeves. One size fits most. Choose a classic or ruffled (pictured) style chemise in your choice of white, natural, or black. Our Drawstring Skirt is made of 100% cotton and is lightweight enough to be comfortable. The drawstring waist allows for easy fitting of most sizes. Choose true red, marine blue, berry, black, green, or bright yellow (see color chart below). Machine wash, tumble dry. One size fits most. Pictured: A Ruffled Chemise in white, our Wench Bodice in Burgundy, and our Drawstring Skirt in Marine Blue.